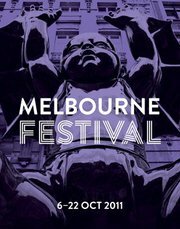 As is the case most years when I come to the end of Melbourne's arts festival season, I feel pretty flat. Too many shows, too many hours travelling and sitting in darkened spaces, too many late nights. And to top it off, I didn't see one dance show which really excited me. Whether this is a reflection on the art or or on me as an audience member is hard to say. You can read my hasty reflections on The Age website, and the (perhaps less hastily scrawled) views of my esteemed colleague Dr Jordan Beth Vincent. Tom Tom Crew: Urban beats and acrobatics, performed by a bunch of hot Aussie blokes. Balletlab presented the world premiere of Aviary: Adorned with amazing costumes, this three act piece ranges from naturalistic mating rituals to nightclub scenes and brilliant, postmodern ballet. We Came From the East: By Papuan choreographer Jecko Siompo, hip hop meets traditional dance, Indo-style. Byron Perry's first full length piece Double Think: A duo of split-second timing for Lee Serle, Kirstie McCracken, some ingenious boxes and lighting. Assembly: Gideon Obarzanek's last creation as Artistic Director of Chunky Move: made with the help of 60 young Victorian Opera singers and eight dancers, it looked at the choreography of crowds and the loneliness within them. Hofesh Schechter returned to Melbourne with Political Mother: an onslaught of live guitars and drums, screaming vocals and gut wrenching action. And finally, my less than effusive wrap of the festival from a dance perspective.